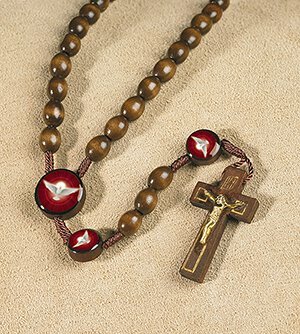 This cord rosary is durably crafted of wood beads and extra strong nylon cord for many years of use. Comes with a Holy Spirit image on the centerpiece and Our Father beads and, by design, easily avoids getting tangled. Includes a prayer card and is value priced to be given away during religious gatherings, including Confirmation celebrations. 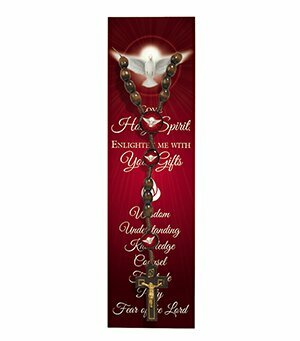 Come Holy Spirit, Enlighten me with Your Gifts. O Holy Spirit, beloved of my soul, I adore You. Enlighten me, guide me, strengthen me, and console me. Tell me what I should do, give me Your orders. I promise to submit myself to all that You desire of me, and to accept all that You permit to happen to me. Let me only know Your will. Amen. "A partial indulgence is granted to the faithful who...raise their mind with humble confidence to God."